The thermodynamic laws (as well as Newton's laws) are for a system, a specific quantity of matter. More often, in propulsion and power problems, we are interested in what happens in a fixed volume, for example a rocket motor or a jet engine through which mass is flowing at a certain rate. We may also be interested in the rates of heat and work into and out of a system. For this reason, the control volume form of the system laws is of great importance. A schematic of the difference is shown in Figure 2.8. Rather than focus on a particle of mass which moves through the engine, it is more convenient to focus on the volume occupied by the engine. This requires us to use the control volume form of the thermodynamic laws, developed below. where includes the sign associated with the energy flow. If heat is added or work is done on the system then the sign is positive, if work or heat are extracted from the system then the sign is negative. NOTE: this is consistent with , where is the work done by the system on the environment, thus work is flowing out of the system. Note how our use of enthalpy has simplified the rate of work term. In writing the control volume form of the equation we have assumed only one entering and one leaving stream, but this could be generalized to any number of inlet and exit streams. which has units of Joules per second per kilogram. For problems of interest in aerospace applications the velocities are high and the term that is associated with changes in the elevation is small. From now on, we will neglect the terms unless explicitly stated. Suppose that our steady flow control volume is a set of streamlines describing the flow up to the nose of a blunt object, as in Figure 2.11.
where is the Mach number2.5. The stagnation temperature is the temperature that the fluid would reach if it were brought to zero speed by a steady adiabatic process with no external work. Note that for any steady, adiabatic flow with no external work, the stagnation temperature is constant. where, the stagnation pressure is the pressure that the fluid would reach if it were brought to zero speed, via a steady, adiabatic, quasi-static process with no external work. An area of common confusion is the frame dependence of stagnation quantities. The stagnation temperature and stagnation pressure are the conditions the fluid would reach if it were brought to zero speed relative to some reference frame, via a steady adiabatic process with no external work (for stagnation temperature) or a steady, adiabatic, reversible process with no external work (for stagnation pressure). Depending on the speed of the reference frame the stagnation quantities will take on different values. where is the vehicle speed. The temperature the skin reaches (to first approximation) is the stagnation temperature and depends on the speed of the vehicle. Since re-entry vehicles travel fast, the skin temperature is much hotter than the atmospheric temperature. The atmospheric temperature, , is not frame dependent, but the stagnation temperature, , is. The confusion comes about because is usually referred to as the static temperature. In common language this has a similar meaning as ``stagnation,'' but in fluid mechanics and thermodynamics static is used to label the thermodynamic properties of the gas ( , , etc. ), and these are not frame dependent. Thus in our re-entry vehicle example, looking at the still atmosphere from the vehicle frame we see a stagnation temperature hotter than the atmospheric (static) temperature. If we look at the same still atmosphere from a stationary frame, the stagnation temperature is the same as the static temperature. For the case shown below, a jet engine is sitting motionless on the ground prior to take-off. Air is entrained into the engine by the compressor. The inlet can be assumed to be frictionless and adiabatic. Equal, by the same argument as 1. Less than, by the same argument as 2. 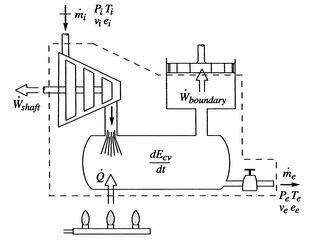 The steady flow energy equation finds much use in the analysis of power and propulsion devices and other fluid machinery. Note the prominent role of enthalpy. Using what we have just learned we can attack the tank filling problem solved in Section 2.3.3 from an alternate point of view using the control volume form of the first law. In this problem the shaft work is zero, and the heat transfer, kinetic energy changes, and potential energy changes are neglected. In addition there is no exit mass flow. Integrating from the initial time to the final time (the incoming enthalpy is constant) and using gives the result as before. A liquid bi-propellant rocket consists of a thrust chamber and nozzle and some means for forcing the liquid propellants into the chamber where they react, converting chemical energy to thermal energy. and , the conditions in the combustion chamber, are set by propellants, and is the external static pressure. Consider for example the PW4084 pictured in Figure 2.15. The engine is designed to produce about 84,000 lbs of thrust at takeoff. The engine is a two-spool design. The fan and low pressure compressor are driven by the low pressure turbine. 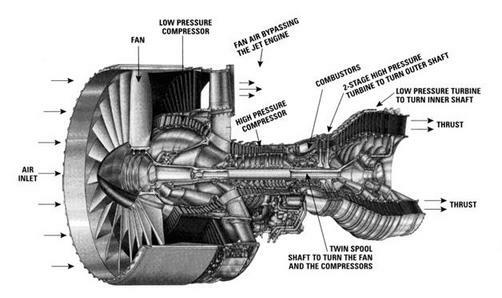 The high pressure compressor is driven by the high pressure turbine. We wish to find the total shaft work required to drive the compression system. Note that . If a car engine has , then the power needed to drive compressor is equivalent to 1,110 automobile engines. All of this power is generated by the low pressure and high pressure turbines.